Most of us have heard of the principle of shu-ha-ri. In (shu) you start kendo and entrust yourself completely to a single teacher who gets you to the next stage (ha). You then have the freedom to learn from other teachers before you reach (ri) and the chance to develop technique under your own guidance. I have never heard a precise explanation of the timescales involved in each of these stages or the grades you need to attain before you move on, but my guess is that you reach ha in the middle dan ranks and only touch on ri when you are firmly into the kodansha stage. This all sounds ideal and I have many friends who were lucky enough to go through junior, middle and high school kendo clubs under the guidance of 7th and 8th dan teachers and they just needed to turn up and do their best. On the other hand I know kenshi from around the globe who are either self-taught or who rely on someone who is their senior by a narrow margin or who are a page ahead in reading the instruction book. There are online and print resources that can help the learning process, but to improve we all need the help of experienced sensei as and when it is available. We can get this type of help by visiting sensei (in your own country or abroad), or by attending seminars when skilled instructors are invited by your club or national federation. I have had discussions in the past with my friend George McCall, of Kenshi247 fame who emphatically points out that this is not the same as learning from these sensei on an everyday ongoing basis. Having had the experience of doing this when resident in Japan I agree with him. 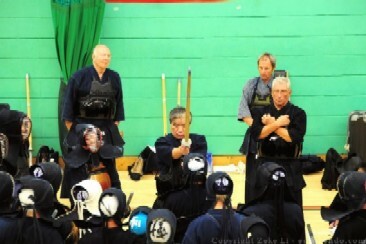 I still feel that any exposure to leading instructors gives your kendo a boost. One of the challenges however, particularly for less experienced kenshi, is that different teachers have different ways of getting us to improve. 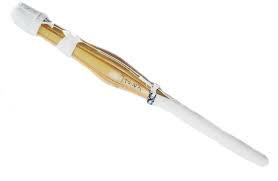 Don’t shoot me if I get one of these wrong, but to the best of my recollection Chiba sensei said bring the shinai back 45 degrees, Sumi sensei said 45 degrees, Sueno sensei said let it go past that point and Iwadate sensei said let the shinai touch your bottom. All of these gentlemen are hanshi, all are capable of highly impressive kendo, all have trained champions and all have different ways of getting us to do correct kendo. My only suggestion is that if you are lucky enough to have the chance to learn from these or any of the other top teachers. Do as they say, try it for a while and see what works for you. This may put you in danger of some premature ri, but hey, nobody is perfect. I am lucky enough to work in an international environment and even luckier because our working language is English, so my non-native speaker colleagues have to work much harder to communicate than do the Americans and Brits. A lady in my office was explaining to a Spanish speaking co-worker that “There are many ways to skin a cat”, meaning various routes to achieving the same goal. She was instantly met with a string of questions about her need to be cruel to animals, what she was going to do with the skin of the unfortunate animal and what did skinning cats have to do with the work topic under discussion. Fortunately I was just an innocent eavesdropper to this conversation, but it made me think that the Chinese / Japanese equivalent “There are many paths to the top of the mountain” gave a far more positive, affirming view of alternate choices. When kendo was first exported to the West, many of the teachers who introduced it were not professionals, so they taught in the same way they learned. In many cases they were taught in primary school and they used the same methods to teach adult beginners. More recently the professional kendo teachers sent out by the AJKF have taken a far more analytical approach to kendo tuition. These experts have worked out the best ways to coach people of varying ages and ability levels. Nevertheless, different sensei have widely differing methods of teaching the same things. One might emphasise making big swings in suburi, another may concentrate on small sharp cuts against the opponent’s shinai to improve tenouchi. Either way the objective is to help the student make correct, relaxed cuts. Some instructors focus on posture, others talk about bracing the abdomen; while others may emphasise the importance of drawing up the left foot after cutting. 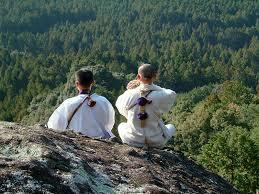 All of these approaches are designed to instil ki-ken-tai-itchi in the student. I have heard kenshi complain that they get widely differing advice from various teachers and don’t know which to follow. This is a challenge, particularly for those in the early stages of kendo development. In an ideal world we should be able to follow the principles of shu-ha-ri, following the instruction of one teacher until we have strong enough basics to branch out and borrow from others. Finally we become capable of improvising and improving technique unaided. For many though, it is a matter of taking advice from whoever will give it. In this case it is worth keeping in mind that “there are many paths to the top of the mountain” or if your shamisen needs refurbishing “many ways of skinning a cat”. When I wrote “Kendo a Comprehensive Guide to Japanese Swordsmanship” my editor asked me to include a section on “hitori-geiko”, or individual practice. I felt that his thinking was to help align the book to the newbie and kendo curious markets where people may feel that they can learn kendo off the page. As I explained several times in the book, kendo is a sport or art, depending on how you look at it, which requires interaction between people; whether it is between competitors, training partners or student and instructor. Suburi, footwork and shadow keiko exercises can of course be practiced alone, but are much more motivational when done in a dojo environment with a group of sweating, shouting fellow enthusiasts. Experienced kendoka can of course work on their cutting action in the home or garden. I remember seeing shinai shaped grooves and scratches on the ceiling of Matsumoto Toshio sensei’s entrance hall and he explained that he had been giving extra instruction to some of his students at his home. Ceiling height is of course a constraint, but we can now buy special suburi shinai that are designed to replicate the weight and feel of a normal shinai while being short enough to swing in a room with average ceiling height. Using this type of equipment you are free to replicate any kendo exercise that you would do in the dojo without a partner; that is providing you take care not to trip over the furniture. Where I do have concerns about training outside the dojo is where the practitioners are self-taught or have tried to put together their own “styles” by extracting pieces of information from books and videos. YouTube is littered with footage of “kendo stick fighters”. This clip is as good an example as any. The two full sized shinai used nito fashion and the cigarette clamped between the teeth of the young man on the left give early warning that it is not going to end well. To my mind you get the most out of home practice if you use it to reinforce and polish what you learn in the dojo. Videos (of real kendo) and books can of course help you understand the finer points of a technique and it is worth both studying information from reliable sources and sharing it with your dojo mates. Ideally though, your training should follow the principle of Shu-ha-ri. Shu, when you follow the principles of one instructor, ha, when you start to add your own ideas and ri, when you formulate your own style. Someone should tell the boys in the YouTube clip that they need to do it in that order. 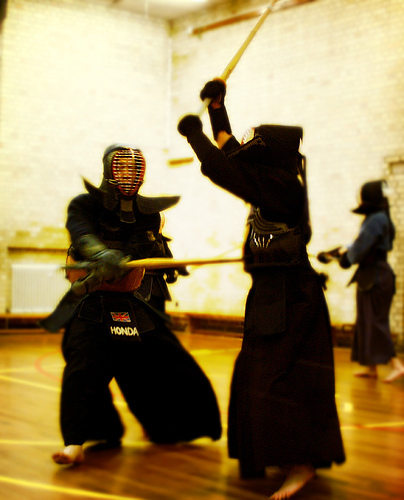 Kendo has a repertoire of set techniques and there is a very strong ethos that students should learn each correctly before they move on to the next. Correct distance, timing, posture, foot placement, size and angle of cut, hasuji and zanshin are prescribed for each waza at each learning stage. Little or no room is allowed for self expression or personalisation. In essence the way we do each kendo technique is set in stone. It stands to reason then that if we study and practice kendo diligently and correctly, we should each perform every waza in exactly the same way as every other kendoka. So much for logic! My post before last covered learning styles, and as often happens the comments I received took on a life of their own and moved on to discuss the best way to approach kaeshi dou. Ken Kuramoto sent a great link to a video of Baba sensei’s version of the technique which was excellent. He executes the technique very quickly, barely raising his shinai from chudan and striking dou with great force. Having said that, I have looked at the kaeshi dou of other hachidan sensei, particularly the well known Hanshi and most do excellent kaeshi dou, and almost all are different. Chiba sensei makes a more obvious block and hits with flatter hasuji. Ohta sensei lifts the left elbow more and tends to complete his zanshin on the same side as the technique, and I could continue to point out the differences that many other kendo meijin demonstrate with this technique. Which is correct; in my humble opinion all of them. Who you eventually copy is a matter of which teacher you have most exposure to; or if you are lucky enough to have the choice, which approach best suits you. As for picking up on and adopting any of the subtle differences that different kendo masters bring to kaeshi-dou or any other technique, that is “ha”. Finally we can start to innovate and stamp our own personality on our favoured waza (ri). But for most of us that is a long way in the future. 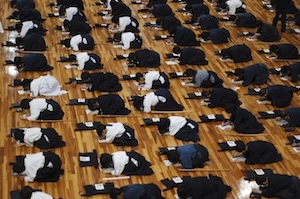 Most people taking a Kendo 3rd or 4th dan examination, where a written test is required, have been given this instruction. Most know that the answer is along the lines of “Shu is following one teacher” “Ha is breaking away to learn from others” and “Ri is establishing your own technique”. OK so given that our exam papers got marked, we would all pass, but I for one, do not really understand the idea in practical terms. There are a wide range of interpretations of this concept. “Shu” is pretty standard throughout them all. “Ha” varies in peoples understanding from seeking occasional help from other sensei, to leaving because you have outgrown your teacher. “Ri” is where the going gets tough …. With explanations ranging from developing your own technique, to achieving “mu shin” or “no mind”, to starting your own school. It is interesting to see, that with some other martial arts, there is indeed a tendency for exponents to start their own schools. I have been suitably impressed by folk in their twenties and thirties who have achieved the rank of tenth or twelfth dan, but this happens very rarely in Kendo. So clearly, few of us feel that we have reached the state of independence described by the the more extreme meaning of “Ri”. As with most things in life, reality is less cut and dried than the theory. When you move on to “Ha” depends on your own level and that of your instructor and the depth of your relationship. Most people spread their wings gently, getting exposure to other teachers and new ideas at seminars and dojo visits. Those with aspirations to be strong shiai players, usually get to attend national squad training and learn from coaches who can take them in that direction. I have heard of a few dojo leaders who expect their students to cut themselves off from other influences, but this is more often than not due to their own insecurity. Once a kendoka has started to put his or her basics in place, I believe that he or she should try to learn as much as they can from as many people as possible. Having said that, it is good to have one special sensei or sempai, who’s kendo you admire; who can give you advice based on deep knowledge of your kendo. Overall the process of improving in Kendo is one of interdependance. We learn from our seniors, our peers and our juniors and if we are lucky enough we should be able to do all three. In Europe it does become more difficult to practice with seniors once you achieve the rank of 6th or 7th dan, but it is essential for ones development, so the onus is on us to attend seminars, to make trips to practice with strong sensei and to ensure that our own kendo continues to grow. As for “Ri”, ask me again if I make hachidan. Photograph courtesy of George McCall.